1. The center of the movie-making universe wasn’t always in California. Astoria Studio, in the NYC borough of Queens, opened in 1920 as Paramount Picture’s East Coast facility. The Marx Brothers W.C. Fields and Valentino starred in movies that were filmed here before Paramount moved completely to Los Angeles in 1933. In the ‘40s, The U.S. Army used the studios to make instructional films, but moved out in the mid-1970’s, leaving 13 buildings in a decrepit state. The Motion Picture Guild expressed interest in bringing the movie biz back to Queens, and in the early 1980’s, developer George Kaufman bought and refurbished the studios, naming it Kaufman-Astoria Studios. Now, Orange is the New Black, Sesame St., the Borne movies, and dozens of other shows are produced here. Learn this history and make your own movies at the interactive Museum of the Moving Image, then explore other parts of Long Island City and Astoria NY following this Getaway Mavens guide. 2. America’s oldest winemaker isn’t in California either. Again – New York. Despite its name, Brotherhood, established in 1839 and considered the oldest winery in the USA in continuous operation, was not founded by monks or priests. Its origins rest in the accidental success of cobbler-turned-winemaker, John Jaques. Back in the 1800’s, wine was often adulterated with additives like drugs, tobacco and even opium (now, there’s a blend for you), but Jaques believed in utilizing grape juice and only grape juice for his wines. He and his sons found a growing clientele among those to whom this purity mattered: pharmacists for medical applications and clergy for sacramental purposes. Jaques established the country’s first commercial winery, then called Blooming Grove, in 1839, and prospered further when the railroad came through in 1850, allowing wines to be shipped to drug stores, grocers and Presbyterian Churches all over New York and the Northeast. The winery officially became The Brotherhood Wine Co. in 1894 after the last Jaques family member died in the mid 1880’s and the property, complete with thousands of gallons of aging wine, fell to the ownership of PR guru Jesse Emerson. Emerson made sure the world knew about Brotherhood Wines, sponsoring World’s Fair and World Exposition brochures and spending big bucks on newspaper advertising. While shepherding Brotherhood through Prohibition by focusing production on allowable “alter wines”, Emerson died suddenly in 1924. During Prohibition, however, Americans lost their taste for alcohol, and sales continued to decline throughout WWII and into the ‘50s. Holding on for dear life, Brotherhood Wine Co. passed to the Farrell family, who, in 1960, came up with the idea of offering free public winery tours. This proved to be Brotherhood’s saving grace – and it became a popular Hudson River Valley destination in its own right, with scores of tourists coming from NY City by bus and car, buying wines and picnicking on the property. Though a devastating fire in 1999 destroyed much of the winery’s buildings, the original stonewalls were left intact and remain centerpieces of Brotherhood’s quick restoration. Now owned by several partners, Brotherhood is focusing on making premium wines and hard cider. So if you recall the sweet wines of yore, you may be surprised by today’s sophisticated vintages. Discover what else to do in the area here. 3. Artist Edward Hopper did not grow up on the windswept New England Coast or in a depressed New York City flat. His boyhood home was actually in the Hudson River town of Nyack NY. Now open for tours, the Hopper House is but one artsy aspect of this artsy town. 4. How was coal transported from the Delaware River to the Hudson River back in the early 1800’s? Prior to the development of dynamite, it took over two million dollars, 10,000 workers, and many lives lost to blast (with black powder) through the wilderness in order to create 108 locks on the 108 miles of the 30 ft wide D&H Canal. Life on the canal was often a family affair, with young children – many of them orphans – driving the mules that pulled the barges. In its heyday, the canal saw a constant stream of nearly a thousand boats, hauling everything from cordwood, gypsum, bluestone (to pave the sidewalks of New York City), glass and shoes. Little towns along the way bustled with business, until the canal was replaced by the railroad. This often forgotten history is marvelously laid out at the D&H Canal Museum, in High Falls, NY, close to New Paltz – home to Historic Huguenot Street, the oldest continuously occupied street in New York State (since 1698). Find out what else to do here. 5. The first owner of the 1661 Matthewis Persen House in Kingston NY was barber/surgeon Gysbert Van Imbroch, who died in 1665 leaving a complete inventory of his home. This inventory, translated from the Old Dutch in 1896, is the basis for a new permanent exhibit upstairs – posters that tell the story of day-to-day life in the 1600’s New World. Among clothing and home goods, Van Imbroch’s holdings included yoke for oxen, ice skates, a child’s coat “made by the savages,” and the largest book collection in the colonies. Depending on your interest, you’re bound to discover something compelling here. Physicians might find the history of barber/surgeons of particular interest. According to engaging guide, Taylor Bruck, “at the time, doctors were strictly diagnosticians, but surgeons were anyone with sharp implements.” Fashionistas might pick up some old ideas to tweak for today, like all-the-1600’s-rage “stomachers” – embroidered triangular bodice attachments that could be swapped out like ties – and the Dutch “bodkin,” a lacing needle that doubled as a head ornament – found on site. And students of political history might be surprised to learn that government regulations are nothing new: 1600’s laws demanded that houses be built with tiled roofs and that homeowners keep chimneys clean (one household fire could destroy whole towns), with stiff fines for non-compliance. Kingston NY has become quite the hipster haven, with a growing number of Brooklyn expats and some of the most stunning murals ever to grace public buildings. Start planning your visit here. 6. In Architectural Studies, the term “duck” refers to any highly sculptural form that represents the products available within. And it all started in 1931 on Long Island NY. That year, Riverhead duck farmer, Martin Maurer and his wife, Jeule, built their sales office to capture tourists driving to Eastern Long Island in order to sell the Peking Ducks they were raising. 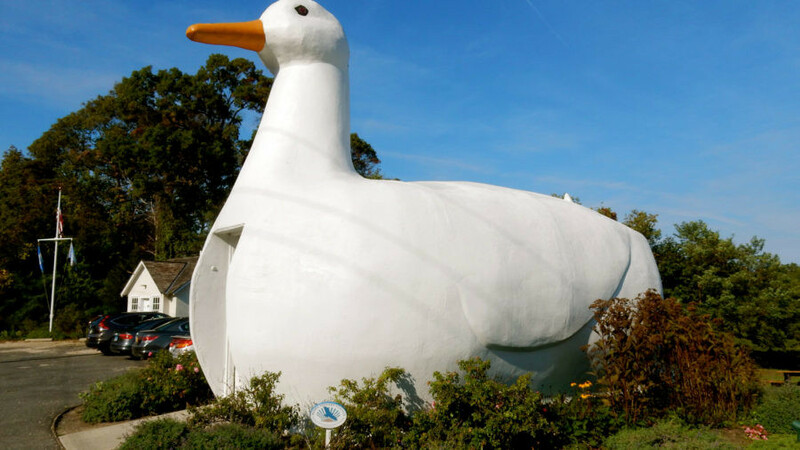 Today, rather than live ducks, the Big Duck Store now sells “duck-a-belia.” The North Fork of Long Island is a bonafide wine region, so stay here for a tranquil getaway. 7. Included in a collection of 12 historic structures at the Southampton Historical Society in Southampton NY, is a one room school house, a 19th century paint store, and my favorite – a pair of outhouses, marked Boys and Girls, with a sign that explains, “These authentic outhouses were used by Southampton Families and are displayed as they were when in active use.” These artifacts at once disabused my notion of the “glamorous Hamptonite” of yore. For more “Offseason Hamptons” ideas, check this out. 8. The juxtaposition of ritzy clothing designer, Cynthia Rowley, with the adjacent somewhat dumpy and still-standing Memory Motel (inspiration for the Rolling Stone’s song of the same name after Jagger and his band spent time here) pretty much sums up the highbrow and lowbrow aspects of extreme East End Long Island town, Montauk, these days. Known mostly as a fishing village, Montauk NY has been attracting a more flagrantly ritzy set these days, to mixed reviews. Regardless, it is still one of the most breathtaking “end of the earth” spots in the USA. Check it out here. 9. Haddonfield NJ is best known as the spot where the first complete dinosaur skeleton was discovered in the USA – back in the 1800’s. But few know that this small suburb of Philly is named after the 21-year-old Elizabeth Haddon, whose father, John, purchased 500 acres in New World for his Quaker family. Due to illness, John Haddon was unable to leave England, and so in 1701 he sent his formidable daughter, Elizabeth, alone to New Jersey, where she thrived. This sense of women’s independence has carried through the generations here – with many Women-Owned businesses and unique shops on downtown streets so precious and picturesque, they’ve been compared to a Dickens scene, especially during the holidays when the town is aglow with candlelight. It’s a quaint, old-school, Truman Show kind of place where locals actually say “good morning” to strangers and engage with parents and kids on their daily procession past brick storefronts and beautiful stone churches to blocks-away Elementary, Middle and High Schools – known, oh my word, as the “Walking School Bus.” See what else there is to do in this lost in time place here. 10. After WWII, Somers Point NJ, which had always been a drinking town, became a rock and roll hub. According to locals, “In the 50’s and 60’s you couldn’t walk down Bay Ave without bumping into hundreds of college kids going from nightclub to nightclub.” Tony Mart’s Club was one of the most prominent music venues, promoting Haley and the Comets, Levon Helm, Mitch Ryder and the Detroit Wheels, Conway Twitty (before he went country), and other rock legends. Tony Mart’s house-band, The Hawks, often opened for other acts. Though he never came to Somers Point, Bob Dylan heard about the Hawks, and later hired them to be his band, subsequently known as The Band. Though the nightclubs have shuttered, there are still some surprisingly fantastic restaurants and “dives,” as well as incredible fishing and crabbing opportunities. Dive in deeper here. 11. During Victorian times, it was customary for hosts to place items of interest, such as books and stereoscopes, on the parlor table so that dinner guests would have topics to discus during the meal. Imagine that. Topics of discussion. When people actually conversed with each other. You’ll learn this, plus the shocking fact that color schemes of the era ran mossy green and muddy brown rather than the vibrant colors of Victorian Homes exteriors today, on a Cape May NJ MAC (Mid-Atlantic Center for Arts and Humanities) Trolley Tour. For more to do in Cape May, read on here.